Almost immediately, our lives changed for the better. In the Microsoft days, Randy would leave before 6am and return home around 7:30pm. He did this to avoid sitting in traffic which is epic on the 520 bridge – the span that connects Seattle to Redmond where the Microsoft headquarters are. He was pretty good about not working on the weekends or in the evenings, but the job was ever-present. Like the big elephant in the room that everyone tries to ignore. He traveled nearly constantly toward the end of his time there. When he was home, he was exhausted from time zone changes and the stress. It was not a life that was sustainable for our family. Fortunately he understood that and together we decided it was time to make a change. The start-up was 2.1 miles from our house. It had a more relaxed atmosphere – more work/life balance. Randy is a self-described “type triple A” personality, so it’s not like he slacked off, but I truly felt like he put family first. He was home around 6 every night and was able to help with drop-offs and pick-ups which allowed me to create my career and take the job as culinary director at Book Larder. There were several scenarios for how the job at the start-up would play out and we talked about them from time to time. Maybe the company would get bought. Maybe he would get recruited for another job at another company. Maybe the three friends would get hired as a power team to build something new. I’m not sure that either of us thought that the company would just implode. But sadly, that is what happened. Fortunately, we had some warning. A couple of months ago, we found out that, unless someone bought the company, the leadership team would be laid off at the end of May. Randy was incredibly busy looking for a job, networking, taking recruiting calls, while simultaneously helping get the company get acquired and also just doing his day job. And then, the last ditch effort didn’t work. His last day was Tuesday. The company is still there and there are a few people still working on business but Randy is officially unemployed. We both feel sad about this for many reasons. He poured a lot into that company both in sweat equity and money. There are friends who no longer have jobs. He is a little unmoored being without a job for the first time since he was 18 years old. Our life and our future is very uncertain right now. We are extremely lucky in that we have just about 100% certainty that he will get a great job. He has been interviewing like crazy and has about 10 opportunities that are possible at the moment. We have enough money stashed away that we don’t have to worry about this little interim period until the next job starts. He is trying to enjoy having a bit of time and being able to focus on just talking to people and finding the right job. Almost everyday for the past few weeks I have gotten calls from him about opportunities. “Would you move to Boise?” “Would you move to San Francisco?” “LA?” “Denver?” “New Jersey?” “Luxembourg?” “South Korea?” My answers to those questions are complicated. I don’t want to move. I want to stay in Seattle. I want to continue to teach my classes at home and work cool events at Book Larder and stay near my incredible network of friends and my family. After working so hard to find the right school for Graham, I don’t want to have to start that whole process again. At the same time, I appreciate that the right job might not be in Seattle. Randy is a fairly senior guy and those jobs are not a dime a dozen. He is an amazing man – so smart, so successful, so hardworking. He should be running a company – if not now then soon. I can’t hold him back from the next step just because I don’t want to move. He is respectful of my feelings and is trying hard to keep us here. But neither of us knows what is next. I went on a great blogging trip this week to Monetery with Dole to learn more about their salad greens. I thought I was leaving on Tuesday but when when I went to print out my boarding pass on Monday night, I realized that the trip was actually Wednesday – Friday. I was relieved. I would be able to be home on Tuesday night and have dinner with Randy after his last day of work. An emotional day for us both. In order to keep the mood light, I asked him what he wanted me to make for dinner. Of course he said Mexican. 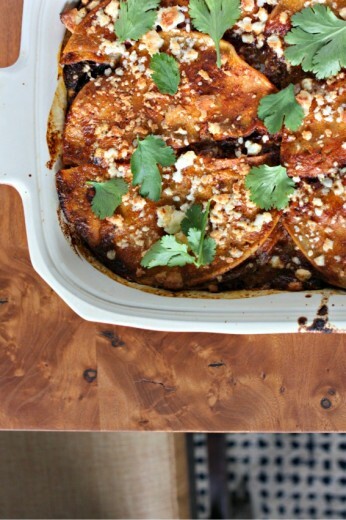 I taught a class at Book Larder last month using some recipes from some of Rick Bayless’ books. I love his recipes and decided to do a riff on one for Randy’s Last Day of Work Dinner. I wasn’t sure what he would think – Randy is kind of a burrito/enchilada/quesadilla guy. I wasn’t sure this “other” type of dish would fly. I hate to say it was like a Mexican lasagne because that does a disservice to both Mexican food and lasagne. But you make a sauce (a salsa really), you layer tortillas with yummy things like sautéed mushrooms and chard and beans cheese, and you bake it. We loved it. Like really loved it. I’m glad that, along with a bottle of special wine and a big salad, we were able to toast the end of this chapter, and begin thinking about the next. I made a lot of changes to this recipe, added in some things, swapped out others, changed the size of the baking dish, but this is still a Rick Bayless recipe. I used canned beans here because I was short on time but ideally, dried would be best. This recipe has a lot of components but they come together quickly. You can always make the sauce the day before. I would imagine, like lasagne, the whole thing can be assembled earlier in the day and just kept in the refrigerator until you want to bake it. Add another 5-10 minutes to the baking time if you do so. With a rubber spatula, working the pasilla paste through a medium-mesh strainer into a bowl. Heat about a tablespoon of oil in a medium saucepan, then add the paste and a pinch of salt. Cook, stirring constantly, until dark and very thick, about 4 minutes. Stir in the broth and simmer, partially covered, for 30 minutes. Taste and season with salt. Keep warm over very low heat. Heat about a tablespoon of oil in a medium skillet over medium heat. Add the onion and a large pinch of salt. Cook until brown in spots, about 10 minutes, then add the beans. Using a potato masher or the back of a large spoon, mash to a coarse purée. Add water or bean broth to thin the beans, if necessary, to an easily spreadable, but not runny, consistency. Taste and season with salt. Cover and keep warm. Heat another tablespoon of oil in a large skillet over medium-high heat. Add the mushrooms and a large pinch of salt and sauté, stirring occasionally, until the mushrooms start to give off their liquid. Add the garlic and continue to cook, stirring occasionally, until most of the liquid has evaporated. Add the chard leaves and sauté until the chard is nice and soft and the pan is mostly dry, about 10 minutes. Taste for salt and season as needed. Spread about 1/3 of the sauce in the bottom of an 8×12-inch baking dish. Put down a layer of tortillas, just barely overlapping. 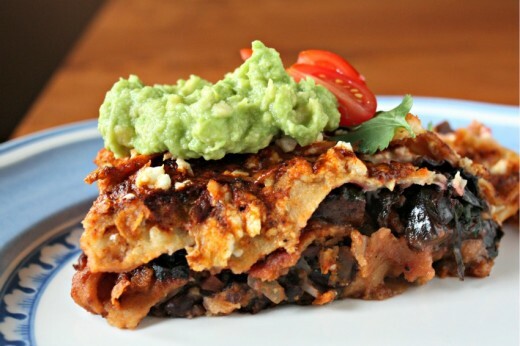 Top with the beans, another layer of tortilla halves, another 1/3 of the sauce, half the cream, and half the cheese. Top with the mushroom mixture. Add a final layer with the remaining tortilla halves, remaining sauce, cream, and cheese. Bake, uncovered, until bubbly, about 20 minutes. Let stand for a few minutes to firm up, then cut into squares. Hang in there, I am sure Randy will be employed soon. There are a ton of opportunities in NYC/NJ area, so come be my neighbor, I will feed you well. Wow, Dana, that’s a lot to have on your plate (and I’m not talking about the delicious Mexican food). Good luck to all four of you during this anxious time. I know that you will make the best of it whatever and wherever it happens. i need a good friend like you in my life. on a sidenote, i’m glad he’s already getting calls–very good sign. This sounds so good. I’ve made something similar but without the mushrooms – and I’m sure that adds a ton. I’m so sorry to hear about Randy, but taking risks is the only way to get far and he definitely doen’t seem like one to flounder for long. Change is scary but it can also be scary good. Good luck and I’m sending you a big hug!!! Hang in there. I live in Seattle and know that talent will be snatched up fast. It is important to keep your priorities. The move from MS was good – it balanced your life. Keep looking for a similar opportunity that will do both – remember you can both work hard and play hard – but family is what will keep you grounded. Best of luck! I do hope it works out quickly for you all! My husband was out of work for one year – it is hard to focus on anything but job hunting. I wish you all the best!! I have learned lately that you need to surrender to what is in your highest good. You and your family are beautiful and have always been blessed. What is right for all of you will unfold. I would hate to loose you to another city but if that is whats in the cards… so they say then you will thrive and grow together in a new community. You will always been linked to those that love you. When one door closes, another one opens. This is especially true for talented people. It sounds like both of you will be fine once the difficulty of adjusting passes (that’s not to minimize the challenge that lies ahead). It’s so nice to see how supportive you both are of each other. Best of luck! Sending come good juju to your family. I’m sure the perfect job will turn up soon. I’ve been craving Mexican lately, I have no idea why I don’t cook it very often, but it’s one of my husbands favorites too, thanks for another great recipe idea! The thing I really love about this post is the way you talk about your husband, like you’re real partners, committed to helping each other grow and work and wrestle with what’s hard. That’s a beautiful thing. Uncertain periods, even short ones, are never easy, but having a good marriage definitely helps. Looking forward (as I’m sure you are!) to hearing where the next steps for you guys are, together. Dana-I’m always so impressed with how well written and thoughtful your posts are, this one especially. While I’m sure Randy will have no trouble finding a new job, based on everything you’ve said about it, I’m sure this is still a tough time. I hope Randy’s able to somewhat enjoy his time off and the next step in your lives is an exciting one for you both. Selfishly I do hope you’re still in Seattle in July as I’m headed that way for a vacation/work trip and I’md dying to take one of your cooking classes! Also, I’m sorry I haven’t been able to comment on your blog for some time- but all your food and of course your trip to South Africa looks amazing! Good luck to you and your family! I am 100% positive that this door only closed for an even better window! Good luck to the four of you. It can’t be easy what you’re going through. I hope things will clear up soon in any direction. It takes real courage to share something so special. I’ll be praying for you and your family as you search for a job. You sound like you are high in spirit. I’m sure that everything will work itself out as it’s meant to be :). 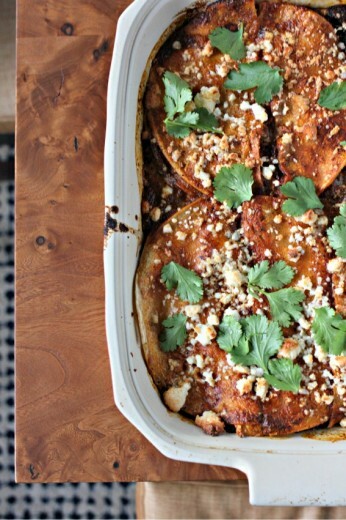 This dish looks & sounds amazing – I’ll be pinning it to save it for the future. I’m so sorry to hear about Randy’s job. But, like others have mentioned, he will most definitely be hired somewhere very soon. I’ll keep my fingers crossed that it’s in Seattle! I’m so sorry to hear about this, but your attitude is so great. It is fair for you to have those thoughts, knowing it would be a huge challenge to move, but not drawing a hard line about it. I am sure it makes Randy feel respected, most importantly. I’m excited to hear what happens, I know there are great things ahead for your family. If I ever get to visit, let’s make this! It looks so delicious, Dana. Thinking of you! Hopeful that the right path will present itself. Hugs. I’m sorry to hear this. My fingers are crossed for you and your family. This looks delicious (your food always does) and yay for a new thing to do with chard. Waiting and wondering what will happen next can’t be fun, but of course it will work out great in the end. Too bad Austin wasn’t one of the cities he mentioned! 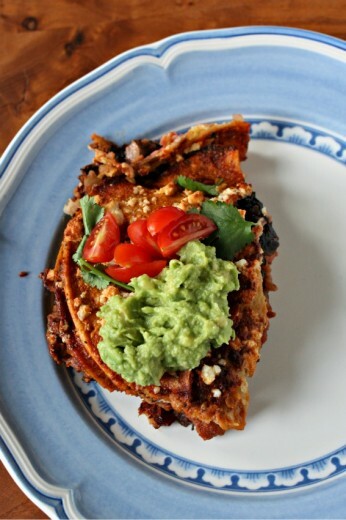 I love this kind of layered casserole, and the guacamole on top looks fantastic. I want a piece for breakfast. I know wonderful things are right around the corner for your family! Sending hugs!